Update 19th August 2015: Apple have released Bootcamp 6, which fixes all of the below when using Windows 10. If you already have Bootcamp 5 installed, run the Apple Software Update utility to get the latest set of drivers. The only oddity I’ve had with Bootcamp 6 is that is resets your DPI scaling to 200%. Windows 10 on Bootcamp (Macbook Pro 13 inch, Bootcamp 5.1) has some teething issues as of build 10162. You might notice Windows hanging for extended periods of time or blue screening – the SSD is literally powering down underneath Windows. The Bootcamp drivers don’t properly support Windows 10’s powering down of the SSD to save battery. 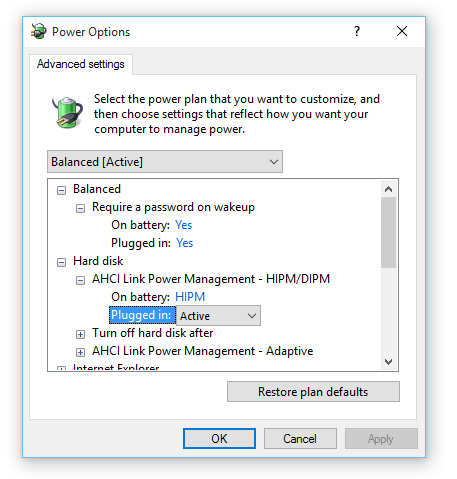 Your Event log might have references to “”Event 129, storahci – Reset to device, \Device\RaidPort0, was issued.” To fix this, you need to disable AHCI Link Power Management and prevent storahci from going into low power mode. 2. Double click the file to import the records into the registry. 3. Right click on the Battery icon in the Taskbar, select “Power Options”. Click “Change plan settings” under the “Balanced” option. Then click “Change advanced power settings”. 6. Double click the file to import the registry entries. This stops storahci from going into Low Power Mode. A restart should then solve the SSD freezing problems. Volume Shadow Copy Service error: Unexpected error CreateFileW(\\?\GLOBALROOT\Device\HarddiskVolumeShadowCopy48\,0x80000000,0x00000003,…). hr = 0x80070001, Incorrect function. 1. 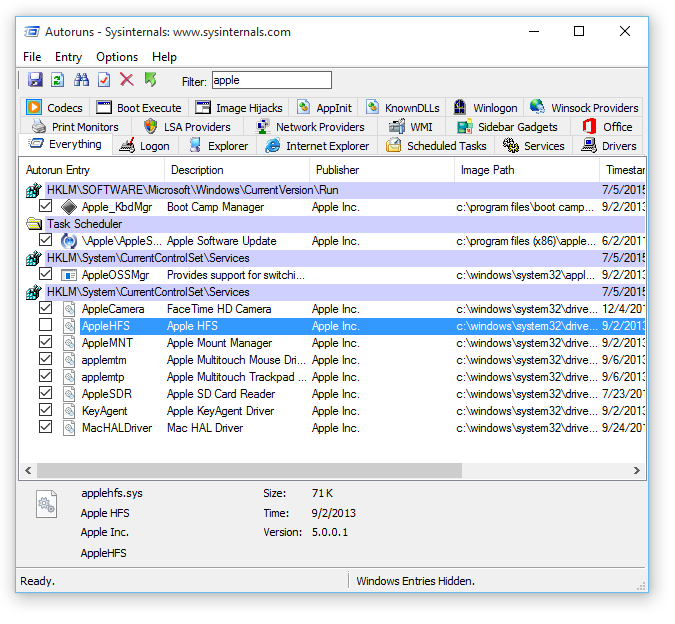 Download Sysinternals Autoruns and run it as an Administrator. 2. Search for “apple” and you’ll see “applehfs.sys”. 3. Disable it by unchecking AppleHFS and restart. You should now be able to create System Restore images and Windows 7 style backups. Hopefully Apple updates Bootcamp for Windows 10. If I find any other issues I’ll update this post. fantastic, I’ve been very worried about not being able to do restore points or full backups. just wanted to say, thanks! I too was worried about not being able to have a full backup for a long time. this fixed the issue. Boot camp 6 released today includes a SingleIO driver. Many thanks, my MacPro running Bootcamp Windows 10 would not backup to my Windows Server 2012 R2 Essentials Server. I was getting VSS errors, Turned off Apple HFS and voila it works!!! Hi ! Did you try to install Bootcamp 6 ? It’s out since 2 days. It includes a SingleIO driver. You solve my problem within minut. I was looking towards micro shoft community, but after unchecking AppleHFS and restarted it works. You solve my problem. Now you are my fevorit bloger and i taken you as bookmark. Thanks a lot bro! I wasted 2 days in german forums to solve this problem… Damn HFS-Sh*t! You are my hero. If it is no problem for you i will translate that into german and post it in my favourite forum. Of course i will give u the reps and make a link to your original post her! First, thank you so much Ed, the hfs problem was driving me crazy, i will put some more solutions so that anybody can make use of them. The most common method of reaching Safe Mode is by tapping F8. This brings up the Safe Mode selections during startup, allowing us to choose the operating mode. However, in order to speed the boot process, Windows 10 has F8 Safe Mode disabled. You can sacrifice a couple of seconds during startup by enabling the F8 menu using the Command Prompt. Begin by opening an elevated Command Prompt. Right-click the Start menu and select Command Prompt (Admin). Select Yes in the User Account Control dialogue, if it appears. Command Prompt should now be open. And press Enter. Job done! Then loading the sysinternals autoron as explained in your post and searching for “apple” then unticking (disabling) AppleHFS, saving and rebooting, fixed my Problem. Windows Backup is working again. I could resolve vss shadow coppy error(0x81000019, 0x80042306) to your support. thank you so much for the Windows 10 backup fix with Sysinternals Autoruns. It worked just find un-checking the Apple HFS. I guess a Windows 10 “NTFS” error while attempting to back up a system image to Time Capsule can’t be fixed anyways? I have been trying to figure this out for ages. THANK YOU.